Threatened Philly school closings face growing resistance. 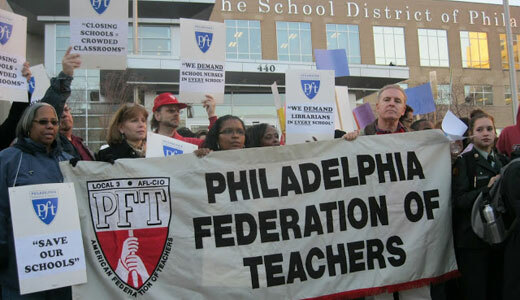 PHILADELPHIA – As the Philadelphia School District pushes ahead with its plan to close some 40 schools at the end of the current school year, deep and organized resistance is growing. On Dec. 12, the District announced the names of the schools slated to be shuttered in June; in the late afternoon a dense crowd of hundreds of protesters massed on the steps of district headquarters to voice their anger, their determination and, in some cases, their heartbreak. The lively and diverse crowd included students, parents, teachers, school support staff and community activists. Chants of “Hey, hey, hey! Don’t take our schools away” and “Don’t believe the hype!” rang out across Broad Street. As darkness fell and TV cameras rolled, one speaker after another took the microphone to blast the School Reform Commission’s plan to downsize the District and hand off many of the remaining schools to outside managers. While the district says it plans to close about 40 schools and reconfigure others in June, it has also proposed the closing of additional schools over the next five years. The news came out during the last school year that it had commissioned an expensive study by an outside firm, the Boston Consulting Group, to recommend ways to solve its financial problems. It has already imposed severe staff and program cuts, and the effect of the latest round of school closings threatens the jobs of additional school workers. The District says that teaching staff cuts will be “minimal”, but it has not mentioned other categories such as school support staff or administrators. In fact, demonstrations of varying size in front of School District headquarters have occurred frequently over the last couple of years. In late December a year ago 50 school nurses received layoff notices; they held regular weekly rallies for months as a result. Over the past summer, 2700 custodial workers, bus drivers and others belonging to SEIU Local 1201 were threatened with the wholesale privatization and elimination of their jobs. Following protests and appeals to the Philadelphia City Council, they did manage to win a contract. The regular and visible expressions of resistance have caused the School District to move more slowly with its plans than it originally intended. It now says that the proposed school closings will be voted on in March of 2013. Yesterday’s rally showed that ongoing organizing efforts by PCAPS and its constituent groups are producing results. 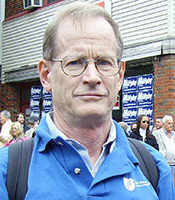 The coalition includes parent and community organizations, the teachers’ union and other unions of school employees, and student groups. The coalition came together last winter and spring as the state appointed School Reform Commission (SRC) publicized its plans for downsizing and privatizing the school system. Meanwhile PCAPS has sought and received input from thousands of parents, teachers and others about their views on solving the problems of the public schools. It was announced at the rally that the effort is continuing and the coalition will soon issue its own comprehensive proposals for addressing the problems faced by Philadelphia’s schools and students.